I've had the same layout with my favourite Blythe Madchen for a long time, but when I got the most lovely email ever I had to reveal something new! These drawings are by Illustrations student Emily Harper for a Portsmouth Uni magazine called 'Quirks' and they're amazing! The cover picture even has the little flying saucers so it seems perfect for the Flying Saucer header. I just love them! Emily is so sweet too, do check her blog called Emily Mews for more illustrations, and even more at her old blog. They are undeniably wonderful, each with little quotes and delicate characters; I look forward to a possible book! My destiny in life too is probably to look like a doll and I love how they're curvy and are even my favourite outfits. Thank you so much Emily!! I am so grateful! Oh my gosh I have lost the will to live, let alone revise! No I lost the will on Thursday and had a disastrous exam on Friday morning, scary! The only one I think I did even half OK in was on Thursday when I wore my new Brian Lichtenberg shirt from Blood is the New Black, covered in Balenciaga shoes. Distracting or what! Even so, I can now assume it is lucky, a great quality in clothes for someone who worries lots. Of course wearing the tshirt print is only a millionth of the luxury of actually wearing a pair, but it does feel super fabulous. The shirtis thin, soft cotton too, the ones that feel the best! This is the only tee I own I think and wanting to show the whole print, I had to pair it with my Ann-Sofie Back x Oli skirt and the leopard print tights I didn't think I wanted to wear with my purple coat, but hey, I do! I need to get a good photo to show how there is loads of material in the coat, especially the back, people walk into it a lot! FYI I got a women's small and shipping was SUPER fast. Also I wore the AA long sleeved dress on Saturday when I went to my gbf's birthday (at subculture for Birmz peeps- I went on stage, fun times!) and it kept falling off my shoulders!! I don't know if that means it's too small or too big but the shorter sleeved one doesn't do this half as much. Now I must tidy my room encase we have another impromptu house viewing from potential renters for next year. People seem very judgemental that there is a lot of clothes around... my wardrobe is small! 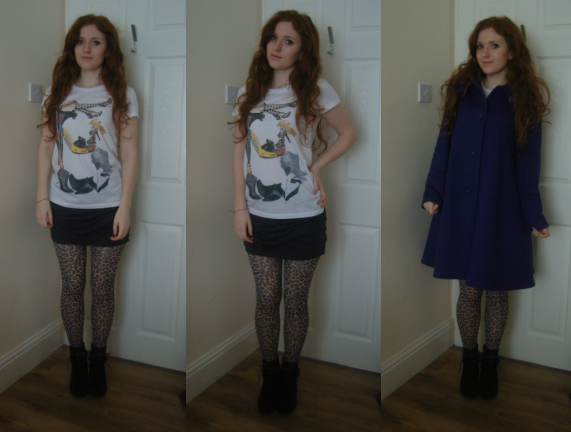 Also I have answered some questions for Megan at the marvy blog Charade, dedicated to fashionable student living! Do check it out if you are indeed fabulous but sadly have a student budget! Even if you're not a student, it has some fab post topics and tips. P.S. As a sorry for talking about exams so much, check out this Teen Vogue video of their Ed Westwick cover (!!!!!!) for March 09. Seriously I need a Team Chuck shirt. I would wear it with pride. I like to dip toes in lots of things but I think I can draw a very big line through 'treggings'- wearing leggings as trousers. Susie was looking super fine in these Chelsea Rebelle For Coco Career's Boutique shiny leggings with BOWS on the back (!!!) and so I had to geta pair in a post-pay-day haze of online ordering. They are the perfect thickness for wearing skirts in bitterly cold days and like Susie said, they arevery very tight! They fall down quite a bit on little old me but feel great to wear and stroke. But see I tried to wear them as just trousers, but I can't! I'm just too well aware that the whole outline of my bottom half is on show, way too much to handle! Despite wearing the shortest of skirts and shortie shorts, it doesn't feel right. The rear view on me might be a bit of a sore sight. I will persevere though and find some way of showing the whole of these beauts off. How do you wear leggings as trousers without feeling super self conscious? With a top that just skims your thighs? I'm guessing a few people might be set against the idea! 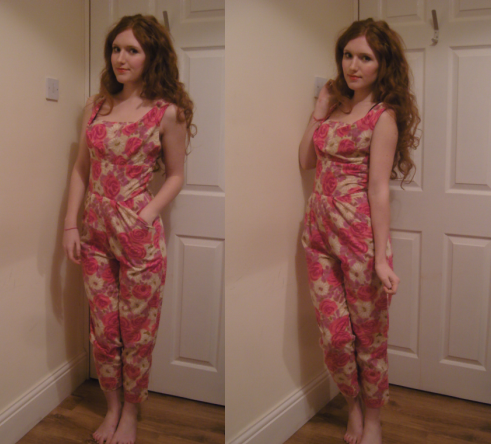 I received the floral jumpsuit! Haha doesn't it look like pregnancy overalls when hanging up? I really really REALLY shouldn't be posting right now but I can't help it, it's too fun! Dressing up in this is superb. I have/had an exam every day this week and preparations could be better. That said, making up little rhymes is the savior! I keep not finishing before the end though, I think it's because they end at quarter to the hour, which messes up your head a bit and at quarter past it still feels like there's a long time left. Anyway I got the jumpsuit yesterday and it's marvy. It's not white like in the picture though, it's more beige, but even in these photos that's not too apparent so maybe it's different to the eye? Omg I forgot to say, on Saturday my Dad gave me a lift back up to Manchester (it would have been impossible to carry allllll my makeup on the train!) and I'd left my phone here over Christmas so I went straight to charge it with the charger from my laptop case, then realised I'd LEFT MY LAPTOP AT HOME! Noooooooooo! I had to be in major revision mode and so I nearly killed myself and had to go all the way home and then get on the train and come all the way back, I'm so stupid!!!!!!!! 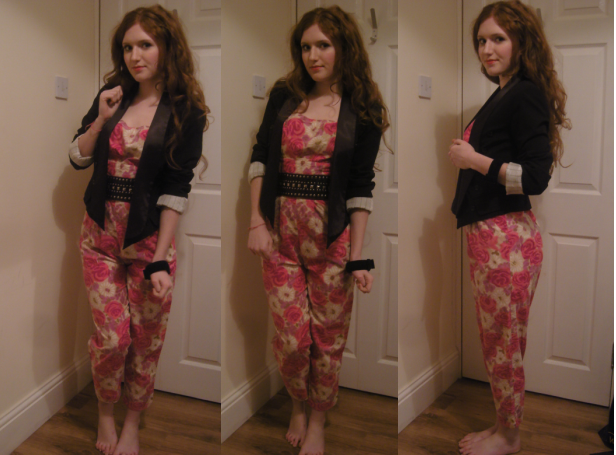 Anyway I just had some light relief making outfits with my new favourite item, although when I'll wear it I do not know! It's got some pieces of elastic going from the corner of the neckline to the back which makes for a puffy bust and it ties at the back for a tight waist. It's so comfy and I feel like a hippy who wears rainbow scarfs and wellies all the time and dances in fields. I will most likely wear it like this, with a Topshop blazer and belt I just got in a sale, although all the popper clasps at the back have fallen off already. Seriously TS quality seems to be going down the drain, but hey that's another (post exam) post. Also see how huge this bangle is in the middle pic! Maybe they should come in different sizes? It's from H&M. Oooo American Apparel shirt! Good times! If I was going to a lecture I'd probably wear this so I could look OK sitting down, then pow as I leave haha. Some girls in my project group were making fun of a girl in a Scooby Doo print dress so who knows what they'd say about this. I don't rave over Scooby but if it makes them happy then shush and stick to your uggs. There's a new Manchester uni trend- uggs with wet look leggings. What is my reaction to this...? And omg I got this leopard print bangle from Poundland!!!!! New recession fashion capital- hell yeah! Luella style!! I had to throw my bag in which I still use every day, despite it being a heavy old thing. It does jangle spectacularly though! 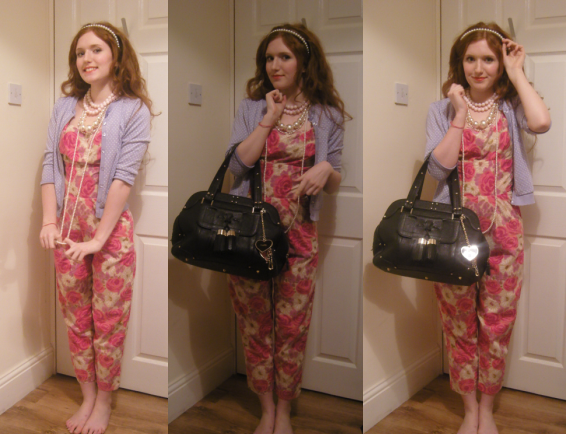 The headband and polka dot cardigan andone of the pearl necklaces are from Primark, or Primarni as EVERYONE calls it here, seriously everyone! I got the cardigan for £3 but apart from a few accessory splurges on bad days, it's the last thing I bought from there. I walk in and like lots of things but I know, if I wasn't already looking for something like it, that I will wear it only a handful of times. This is just a fun take on Topshop Unique's SS09 show as I've been lusting after their lookbook all day. The shirt is men's Ben Sherman that I was going to put on eBay but didn't have time, the headband is H&M and the Docs are still covered in V Festival mud which has now covered my floor. Still, cleaning is a great revision dodging activity! Ah how annoying too that I'm wearing this bright orange/pink lipstick but you can't even tell! 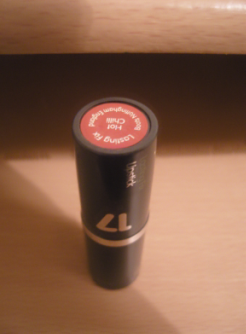 Crazy lipsticks are the new eyeshadows people. I wanta neon peach one too, but for the pink/orange this Boots colour in Hot Chilli is perfection! Sorry to sound a little nuts in this post, I really am dying of revision. FYI about the post below...I'm a UK 8 on top, 10 bottom and I take a medium. I've found for the black this is perfect, the fabric isn't very thin and it's comfortable, but the purple medium I have is quite stretchy. They do give a little once worn. They are actually a lot longer than these pics. I'm 5'5 and mine can reach nearly to my knees, but I like to bunch it up slightly at the waist so it's shorter. If you like bandage skirts you will have no problem with these. Don't fear the dress! Also as Rachie commented, H&M have some identical twins of the short sleeved versions for half the price- buy them up quick!! Right for the actual point of this post, I spent the past 4 months working in Lingerie (in Debenhams- the uniform was NICE...!) and have been meaning to make this post for about that length of time! The top questions I was asked were 'where are your strapless bras' and 'where are your backless bras'. Seems low back dresses are reeeeeeeeal popular. We didn't actually stock a backless bra, but check out Claire's fab review of a La Senza one on The View From Here! I have a clear back bra that fastens at the side with a clear plastic strip across the back but the thing is, you can still see the clear bit, and in a previous post many of you said you disliked clear straps. I don't mind them as my hair covers my shoulders 90% of the time. Plus many Debs shoppers came with 'fuller busts' i.e. DD and above, and these bras only go up to a D, BUT Debs own range is stocking them soon, if not now. But after telling every customer that we only did clear backs up to a D cup, I made a discovery I wish I'd made a looong time ago, or I wish someone had told me! Is everyone secretly wearing these? The amount of them I threw away that came free with bras in the past is awful. You can get a low back extender (for a mere fiver in La Senza) which is just a long (plastic or material) strip which, instead of fastening both sides of your bra together, you clip one side to one end, wind it round your stomach, and clip the other side to the other end. The picture is pretty self explanatory? They are PERFECT for AA u-neck dresses as you can wear any bra you like but make it low back mwahahaha. 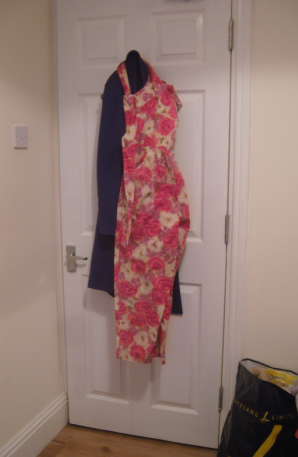 I don't know if I mentioned this before but I got this dress in the Topshop sale and was going to pair it with bright coloured tights and pretend to be a member of The Saturdays. But I lied to myself in the changing room and it didn't really fit, and I knew I'd never get round to altering it properly. My sister is obsessed with her birthday outfit at the moment, looking for the perfect red backless dress, she's loving all over everything backless. So she tried it on before I took it back and it fits perfectly as she has an insane bust and I don't particularly! 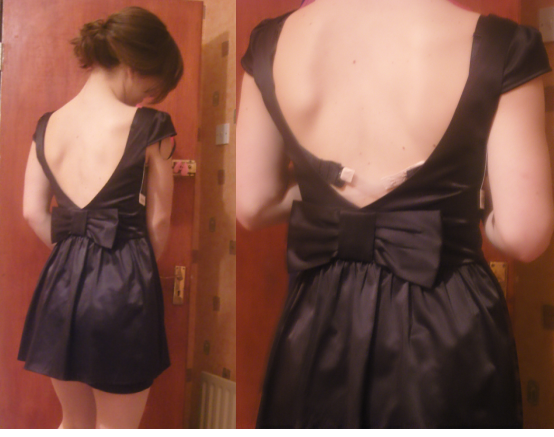 The dress is really quite low, if you bend your elbow at your side, it hits about that low, and the converter worked great! She pulled it up a bit at the back here to show you, and she partied with it on all night in a gay bar where everyone said she looked fabulous haha. Why are we related! Also because Debs has so many concessions, I discovered the best enhancing bras EVER! A few years ago I tried a Wonderbra and it was rubbish! They really only workif you've got lots to put in them, but if you'd love some kind of definition or cleavagee and have given up, these bras are amazing. They're called Atlantis and are by Panache, and theirlabel reads 'warning- your bust will look big in this!'. If you don't like padding then don't read on, but the padding in these really is to push up what you've got, no matter how small, as they come in an AA cup too. Seriously go try one on, put your clothes back on, turn to the side and boom, the bust you thought you'd never have! They look totally natural because you can see the definition of your real bust, rather than just padding under a tshirt. It's times like these when I wonder how many guys read here... anyway, these are great! Because of Mega Days where staff could double dip the discount, and many many sales, I've got one in each style in the end for lots cheaper. I don't know if they still have the sale on, but half the range went from around £20 down to under £10! Go now! As for the styles, the shiny t-shirt bra on the left has the most effect. It cuts really low and is full of gel, so it totally does the ultimate job. The strapless one in the centre has quite firm padding, so it's fine to wear strapless and still push you up. The third one is in the normal pattern styles which plunge and give you cleavage. I don't wear these bras daily because I'm not that bothered about looking bigger, but they are great for nights out and special occasions for a little confidence boost. Also I wouldn't recommend them for daily wear as they are very moulded so it would not be best to wear all the time. By the wayTriumph do a 'minimiser' bra, which claims to decrease the look of the cup size for the wearer, before some of you ask again! Also Debs have their own fuller bust range called Gorgeous which is half the price of Freyas and Fantasies! But I can tell you now, I will always be jealous of my sister! Low back extender pic from MagicBodyFashion. I'm in a swamp of revision, but I must quickly say that the long sleeved u-neckdress is perfection. My package arrived today and it's already the best foreseeable outfit for my gbff (gay best friend forever) Tom's birthday in a metal club, a giant house party for my house-mates' joint birthdays, my sister's 18th, and a trip to a rave at Bristol Uni, all in the next month. This can't do can it? OK I'll substitute some outfits, maybe a sailor dress and erm, the short sleeved version? Also do you wear a belt with your dress? The beauty of these is that you can just leave them, but friends always think a belt would look good...hmmm... also have you seen the new Skins adverts? 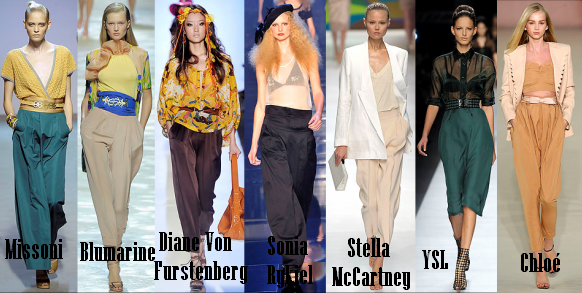 Also fashion tv just spelt Vogue 'vougue'...Also if you haven't got a u-neck dress yet you must! I take a Medium. Ohhh revision is no fun. p.s. the H&M look book pics are directly here and those bikinis are apparently out March/April. I used to trawl through ebay, sometimes just typing in 'vintage dress' to get a huge variety. But I tempt myself with 'just one more page' encase the dream item is a click away and end up searching forever! So it's been a while since I've bought anything, especially so as I only ever seem to buy vintage from America. 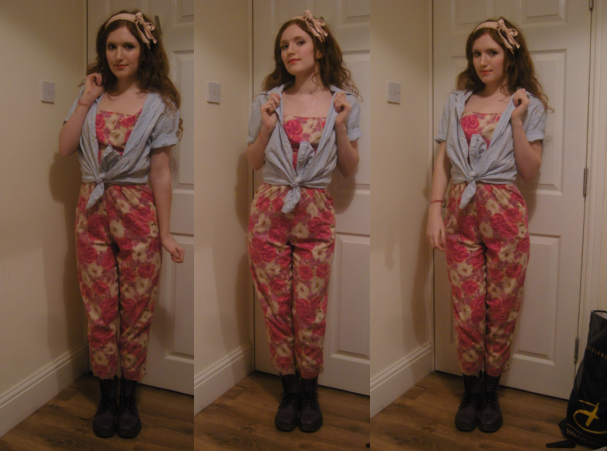 I happened to chance upon this floral jumpsuit last week and have stalked it every since. God knows when/how/where I'll wear it but nothing is more appealing than a bright all-in-one right now. 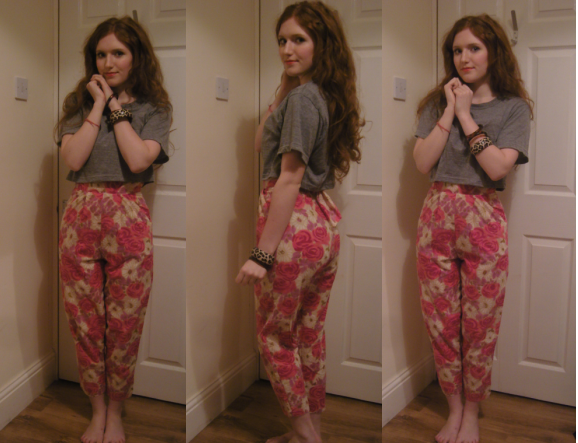 I think I have been inspired by Book of Miri as she is great trouser inspiration. If you haven't before, you must check out that fabulous blog! I'm picking up a package at the post office tomorrow, not 100% sure what it is, but I'll definitely be looking out for this jumpsuit, I hope it comes fast! Check out Kingston Avenue Vintage too, one of the few shops left where prices don't sky rocket! I do feel a bit mean putting in last second bids but it's the only way to win. Not that too many others were bidding on this! 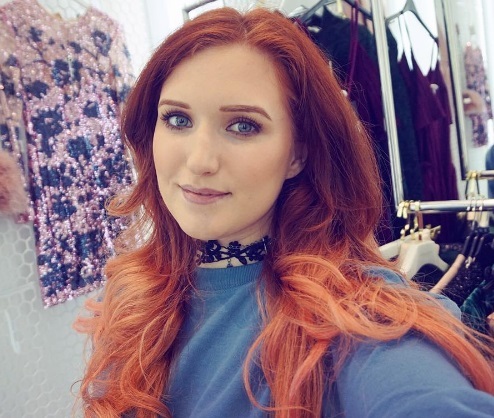 Susie Bubble kindly showed us some high street lookbook highlights, making me very excited for the coming few months, thanks Susie! River Island is high on my list to watch as they're dresses are usually around the £40 mark, which seems even smaller when they pass on the lowered interest rates and the prices go all funny. Today the Observer Woman showed some of H&Ms new threads and you can see the rest on Nitroliciousas always! They make me really want a light coloured blazer, but those colours aren't usually great on me so it' s a bit of a conundrum. But do my eyes deceive meor are those Miu Miu-esque biker shorts in the 4th pic, but in shiny pink, gold and black? Can't wait to get a look at those! The pink skirt below is already in stores here and it's lovely, I might have to go back! I'm waiting for my loan to come in though, and already have a few packages on the way, I haven't had a package in ages! I do like the rolled up trousers here too, will definitely try that with the green H&M pair in the post below. But trousers under a dress? I don't think I have any suitable dresses, then again... and wowza, this jumpsuit is amazing!!! It really annoys me that they're are loads of jumpsuits in the sales but I don't like any of them; they're all a bit 80's? Hopefully this zebra beaut may be a sign that they'll get a few in. I do actually have a H&M jumpsuit from a looong time ago but it's olive green and sort of army/military style? However the main things I'm lusting after are these two bikinis. I was lusting after some high waisted bottoms all summer but never found any, so I'll be making weekly trips to H&M once more. All this revision is really rubbish though, I can't wait for the day that I won't ever have another exam. But I've discovered the FashionTV channel and just let that play in the background with runway shows back to back. They do some great model profiles too. Having loads and loads of tights doesn't make it any easier to get dressed in the morning, as I know mine are in a huge bundle! Does anyone have any ideal tights storage solutions? It seems even when you hang them up, you can't tell which pattern they are! Also if you're like meand don't want to throw away every pair that gets a little ladder, you end up trying on about twenty pairs to get one without a hole, cursing your frugal self! There aren't any kind of skirts I'm drawn to this season, but hello trousers! Or pants as you Americans might say. Now everything is high waisted and rather round, tapered at the ankle with a little on show, so maybe time to look at socks? This makes to show off some fabulous heels, but I still haven't found a pair with the perfect daily height. 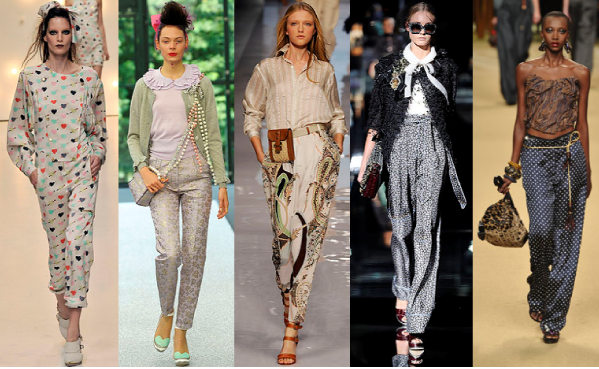 I do hope somewhere brings out printed trousers like the beauties below! I fancy a floral pair. However, how great would a really silky or even metallic pair be? One of the best collections for ages, how could you not want to be a Chloé girl again! I do have some satin leggings on the way. 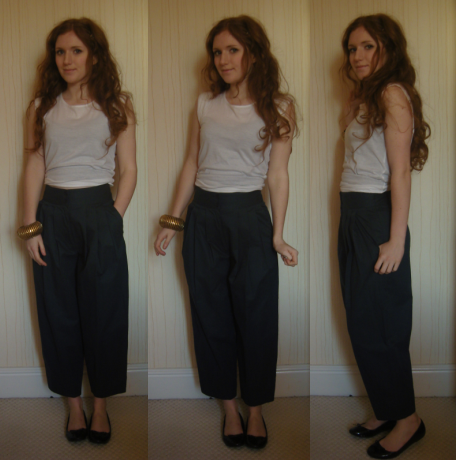 I think I'm swaying towards trousers right now over dreaded revision time as they do make you feel more serious than flimsy skirts, plus are less hassle. 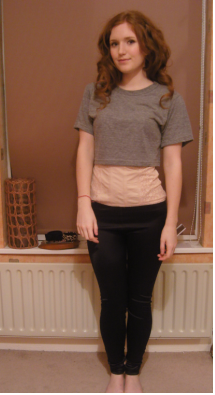 I popped into the H&M sale which is marvy and got a peach corset top for £3! They've brought some Spring stuff that's all pastels and florals, which is so far a bit alien, but they did have these fab green trousers that I showed my Mom, but they were about £25, then I found the sale in the corner and there were exactly the same pair for £7?! I picked up both and tried them on, looking at the buttons and stitches, and they're seriously identical, I don't know what's gone on there! I'm thinking they'll be great with my fake fur shall. The only problem is I can't really wear them with my coat, as bright purple and green might be a bit painful, so I'll get out my Topshop blazer from the Spring and wait until the weather warms up! Ooo I'll wear them with cropped t-shirts too. My replacement American Apparel shirt (after the toddler disaster!) is on the waybut I just saw an advert for Clean and Clear and the girl with the invisible spot is wearing one... hmmmmmmm...!